When it comes to catalogs, 1951 is a tough year to beat. Hamilton's catalog detailed every model on it's own page in a thick folio. 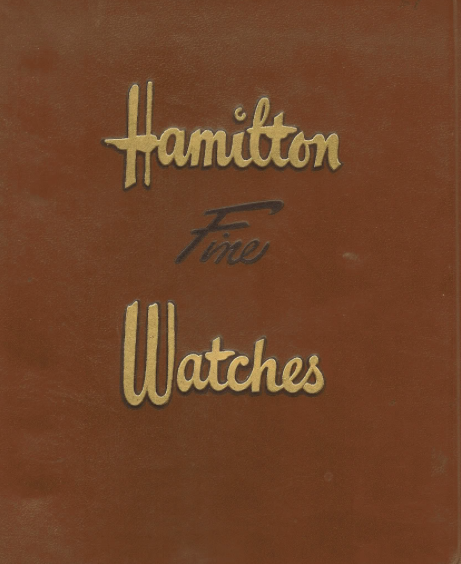 It's purely conjecture on my part, but I wouldn't be surprised if Hamilton started to cut costs in 1952 by simplifying it's marketing materials, as the difference in quality between the 1951 catalog and 1952 is dramatic. One of the watches introduced in 1951 was the Blake. It was produced for three years. Although bracelets first appeared sporadically in the early 1930's, bracelets became much more commonplace in the early 1950's and it's the only time you'll see Speidel bracelets occasionally used on Hamilton watches. The Blake came in a 14K yellow gold filled case. 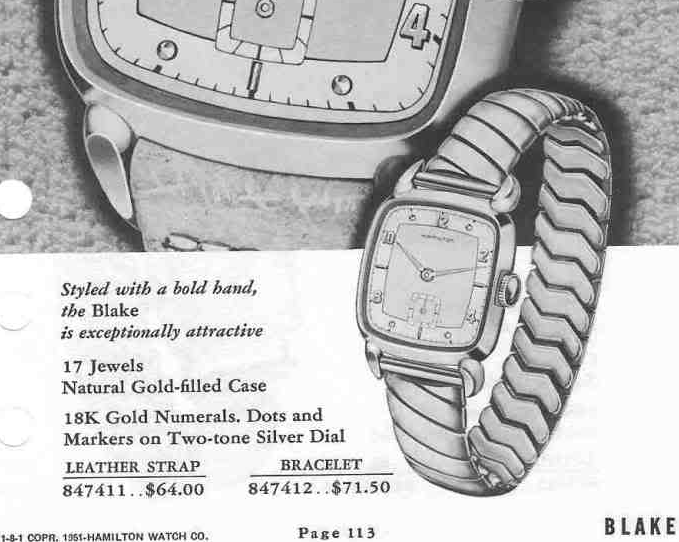 Like most other models, it featured solid gold markers on a sterling silver dial. In the case of the Blake, the markers were dots, numerals and rectangular markers. Tucked behind the dial is a 17 jewel 747 movement. I recently purchased a Blake project watch and I took a bit of a risk with it. As you can see below, it's missing it crown and it's rather dirty too. You never know what you're going to find inside a watch that's missing it's crown. It could be a rusty mess. The watch is inscribed with initials of it's original owner and it was a Christmas present from 1952. My favorite type of presentation. Looks like the watch isn't only missing its crown, it's also missing its stem. It doesn't take an incredible eye for detail to notice the minute hand is also missing from the watch. The dial is a bit grunge but I might be able to clean it up so the two tone butler and white finish will look better. The movement doesn't look too bad. There's a bridge screw missing but otherwise everything looks okay. The balance is the most important part in a watch so I'm glad to see that appears to be in good order. There's no doubt what this model is... the name is stamped inside the case back. The 747 is probably my favorite movement. It's the very first movement I ever took apart and it's simple and straightforward to reassemble. Of course, that doesn't mean I never screwed one up before... I've done that plenty of time but that's the tuition in the watchmaking school of hard knocks. A new glass crystal will be a nice addition to the finished watch. Getting the right hands is a critical part of restoring a watch. As a general rule, the hour hand should just reach the closest hour marker and the minute hand should reach the closest section of the minute track. This watch is relatively square but that especially important with a more rectangular-shaped dial. The reassembled movement is off to the timer and it appears to be running two+ minutes fast per day. The regulator was set a little fast so a slight tweak brings the time right in line. Notice how the two lines approach horizontal. That's the effect of my moving the regulator. The dial and movement go back into the case and a new crown completes the restoration. The dial cleaned up nicely. It still shows some spotting but I will too when I get to 60+ years old, I bet. It's amazing what a little elbow grease will do to improve the outside of the watch case. Now you can clearly see the engraving on the back. Despite it's original filth, this watch is actually in great condition and it runs as good as it looks. I just got a Blake, it's probably tied as my favorite with the Kennett.